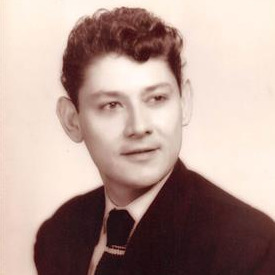 Ramon C. Vaca, 87, of Kansas City, KS, passed away January 26, 2019. Visitation will be 5-7 pm, Friday, February 1st, at Porter's Funeral Home, 1835 Minnesota Avenue, Kansas City, KS. Funeral Mass will be at 10 am, Saturday, February 2, at Sacred Heart-Guadalupe Parish, 2544 Madison Avenue, KCMO, 64108. Burial at Mt. Calvary Cemetery. Ramon was born in Kansas City, MO to Conrado and Isabell. At an early age, his family relocated to lxtlan de Los Hervores, Michoachan, MEXICO, where he resided till the age of 17 and returned to the United States. Where upon his return he met and fell in love with the love of his life, Juana Villa. Where they remained married for 67 years. They built a wonderful life for each other and were blessed with 9 beautiful children. He was an employee with the Kansas City Stockyards, and the American Royal, where her retired from both. He loved driving the Botars in the American Royal Parade. He was a member of St. Thomas the Apostle Church in Armourdale, KCKS, where he remained a member till it was closed. He then became a member of St. Joseph/St. Benedicts (All Saints) Catholic Church in KCKS, till his health started to deteriorate. He was a member of St. Vincent De Paul. He enjoyed his Cursillo meetings and regularly met with them at McDonalds. He was a lay minister and taught marriage prep classes. Ramon enjoyed traveling this beautiful country of ours and the world. He was preceded in death by his father, Conrado Vaca, his mother Isabella Cortez Vaca, his brothers Epiphano, Rigoberto, and Conrad, his sister Consuelo Ayala; his daughter in law Siegliende; his son in laws Patrick Casper and Charles "CJ" Washington. Survivors include his wife Juana Villa Vaca of the home, children Raymond of El Paso, TX, Ralph (Teresa), Valerie, Ronald (Keri), Victoria, Vanessa (Steve), Venetia (Adrian) and Roland all of Kansas City, KS, Veronica of Norfolk, MA. 23 grandchildren, 24 great grandchildren, brothers, Miguel (Elaine), Jesus, and Francisco (Laura), sisters Marina Tinoco, Paublita Tinoco (Joe), Anita Esparza (Bibiano), and Juanita (Alejandro). May God bless you and you family in this time. My deepest condolences. Deepest condolences from the Hilts family to the Vaca family. I have fond childhood memories of visits to my Uncle’s family’s home. Very hospitable, gracious and a joy to be a guest. Many years ago Tio and Tia visited us up here in Maine and I hope I was as hospitable and gracious as they were to me. Most heartfelt condolences to the Vaca family. Love to you all Celia and Bill Gould. Condolences to Ralph and Charlotte.